In prior work we detected reduced anti-Aβ antibody titers in Aβ-vaccinated transgenic mice expressing the human amyloid precursor protein (APP) compared to nontransgenic littermates. We investigated this observation further by vaccinating APP and nontransgenic mice with either the wild-type human Aβ peptide, an Aβ peptide containing the "Dutch Mutation", E22Q, or a wild-type Aβ peptide conjugated to papillomavirus virus-like particles (VLPs). Anti-Aβ antibody titers were lower in vaccinated APP than nontransgenic mice even when vaccinated with the highly immunogenic Aβ E22Q. One concern was that human Aβ derived from the APP transgene might mask anti-Aβ antibodies in APP mice. To test this possibility, we dissociated antigen-antibody complexes by incubation at low pH. The low pH incubation increased the anti-Aβ antibody titers 20–40 fold in APP mice but had no effect in sera from nontransgenic mice. However, even after dissociation, the anti-Aβ titers were still lower in transgenic mice vaccinated with wild-type Aβ or E22Q Aβ relative to non-transgenic mice. 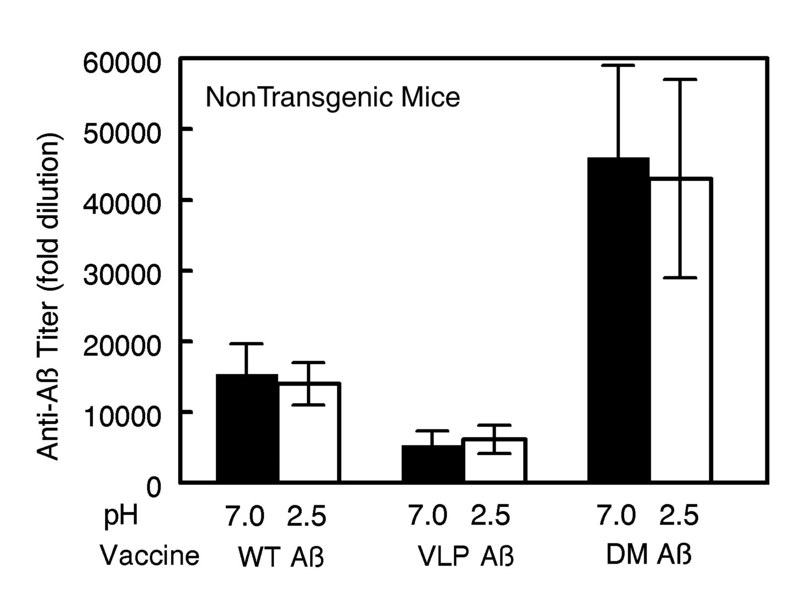 Importantly, the dissociated anti-Aβ titers were equivalent in nontransgenic and APP mice after VLP-based vaccination. Control experiments demonstrated that after acid-dissociation, the increased antibody titer did not cross react with bovine serum albumin nor alpha-synuclein, and addition of Aβ back to the dissociated serum blocked the increase in antibody titers. Circulating human Aβ can interfere with ELISA assay measurements of anti-Aβ titers. The E22Q Aβ peptide vaccine is more immunogenic than the wild-type peptide. Unlike peptide vaccines, VLP-based vaccines against Aβ abrogate the effects of Aβ self-tolerance. Vaccines directed against the Aβ peptide reduce amyloid loads in amyloid precursor protein (APP) transgenic mice  and protect mice from amyloid-associated memory impairments [2, 3]. Although a fraction of patients in a clinical Aβ vaccination trial developed adverse reactions [4, 5], there are indications that some patients benefited from the immunization . Thus, although reformulation may be necessary, some form of anti-Aβ immunotherapy may still be a useful treatment for Alzheimer's Disease (AD). Several groups, including our own, have noted reduced antibody titers in mice transgenic for human APP compared to nontransgenic mice [7–9]. Typically, this was attributed to some form of self-tolerance that could be partially overcome with additional immunizations. One approach to overcoming B cell tolerance to self proteins when producing vaccines has been to conjugate the self-antigen at high density to papillomavirus virus-like particles (VLPs; ). 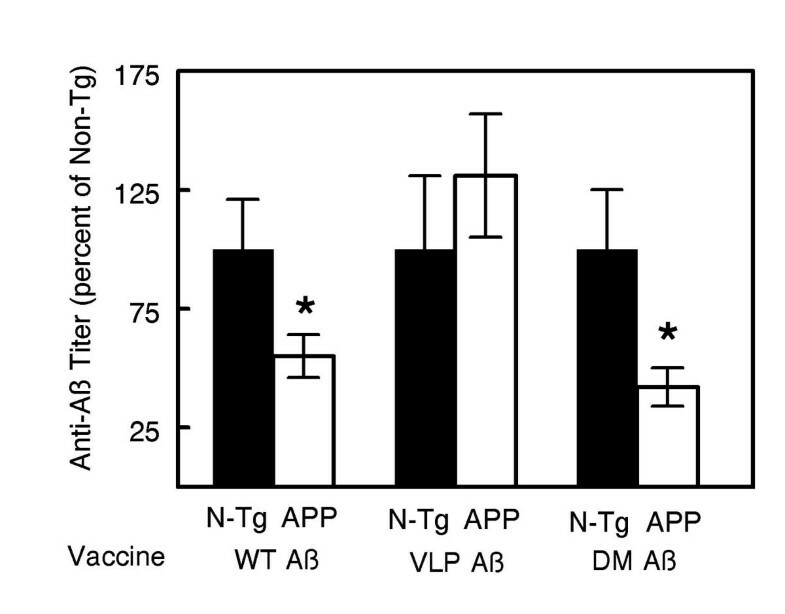 To examine whether self-tolerance plays a role in diminishing immune responses against Aβ in APP Tg mice, and whether VLP conjugation could overcome tolerance, we compared the ability to induce anti-Aβ Ig responses using wild type human Aβ peptide and VLP conjugated Aβ. In order to detect Ab in the Tg mice, we developed a technique to detect anti-Aβ antibodies that are masked by circulating Aβ. In addition, we examined the immunogenicity of a human Aβ variant believed responsible for hereditary cerebral hemorrhage with amyloidosis Dutch-type (DM Aβ peptide) , in both WT Aβ and non-transgenic backgrounds. Antibody responses in APP Tg mice vaccinated with WT or VLP-conjugated Aβ were examined by ELISA using our standard procedures  and anti-Aβ antibody titers were almost undetectable using both protocols (Fig. 1, pH 7.0 results). However, nontransgenic mice did exhibit readily measurable titers (Fig. 2, pH 7.0 results). For the DM Aβ vaccine high anti-Aβ titers were detected in both genotypes, albeit lower in the transgenic animals. This prompted us to test whether circulating human Aβ might be masking anti-Aβ antibodies in the transgenic mice. When we compared several methods of dissociating antibodies from their antigens, including dithiothreitol (100 mM), β-mercaptoethanol (0.5%) and reduced pH (pH 2.5 as described in methods), we found the acid dissociation procedure resulted in the greatest increase in anti-Aβ antibody titers (4 fold greater than any of the other treatments). We then tested if antigen-antibody dissociation would increase the apparent anti-Aβ titers by comparing incubation of the sera at pH 2.5 versus pH 7.0. 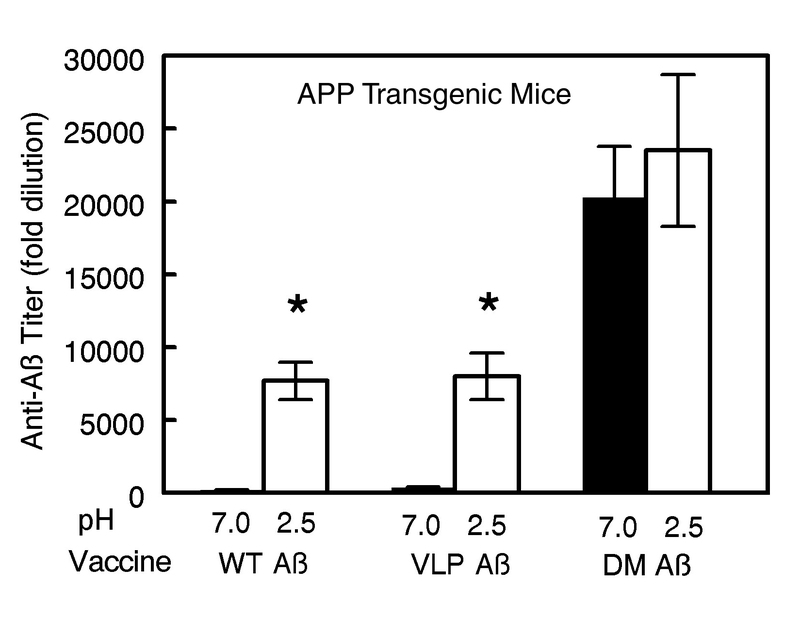 Transgenic APP mice immunized with Aβ vaccines have increased titers when incubated at pH 2.5. Results are from sera obtained 14 days after the fourth vaccination. Aliquots from each sample were incubated at either pH 2.5 or pH 7.0 for 20 minutes, separated by centrifugation through 10,000 MW filters and brought to neutral pH for standard ELISA assay. Data presented are mean ± sem. * Indicates P < 0.001 compared to pH 7.0 (values at pH 7 are 200 and 400 for WT and VLP respectively). Sample size is 5–6 per group. Nontransgenic mice immunized with Aβ vaccines do not have increased titers when incubated at pH 2.5. Results are from sera obtained 14 days after the fourth vaccination. Aliquots from each sample were incubated at either pH 2.5 or pH 7.0 for 20 minutes, separated by centrifugation through 10,000 MW filters and brought to neutral pH for standard ELISA assay. Data presented are mean ± sem. Sample size is 5–6 per group. The low pH dissociation procedure caused a dramatic elevation of the apparent anti-Aβ antibody titers in sera collected from transgenic mice (Figure 1). The titers increased from values near zero in the pH 7.0 incubation to roughly 8000 in the pH 2.5 incubation (t-test; P < 0.001; WT and VLP vaccines). Samples from mice inoculated with the DM Aβ peptide showed only a slight increase after dissociation which was not statistically significant. Importantly, under all conditions, the sera from mice inoculated with the DM peptide have substantially greater antibody titers than mice inoculated with WT Aβ or VLP Aβ. 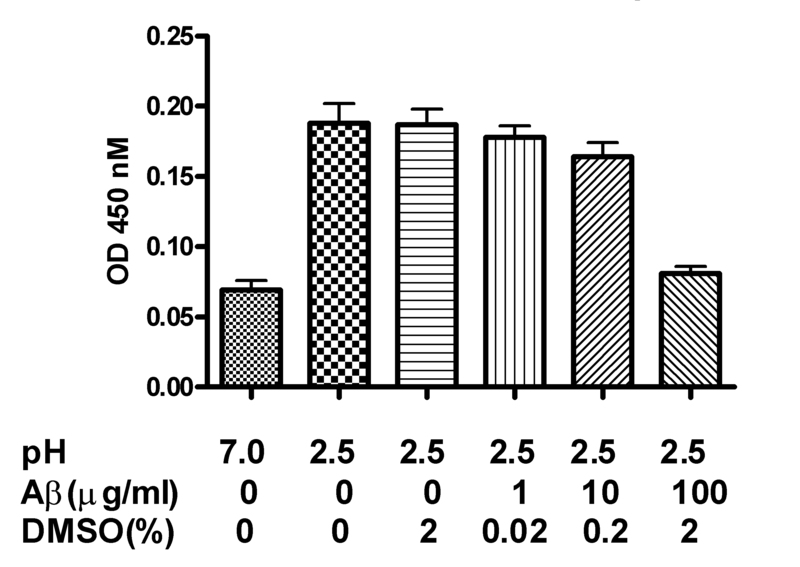 However, in sera from nontransgenic mice, which do not express human Aβ, there is no effect of the acid dissociation treatment on the ELISA values (Figure 2). This indicates the increase in transgenic mice is likely due to dissociation of Aβ from the antibody in the low pH condition rather than some nonspecific modification of the antibodies caused by transient incubation at low pH. It also implies that recovery of the antibody activity is relatively intact after acid dissociation, otherwise the titers should be reduced by the exposure to low pH in the sera from nontransgenic mice. Again, the titers in mice vaccinated with the DM peptide were significantly greater than the titers observed in mice administered the other two vaccines (P < 0.05). We then directly compared the anti-Aβ antibody titers in transgenic and nontransgenic mice after acid dissociation (Figure 3). Importantly, even after unmasking the antibodies with the acid dissociation, the antibody titers in transgenic mice were lower than the levels found in the nontransgenic animals for mice administered the WT or DM Aβ vaccines (t-test, P < 0.05). However, for mice administered the conjugated VLP-Aβ vaccine, antibody titers were equivalent in the transgenic and nontransgenic mice. These data argue that self-tolerance may exist in the APP transgenic mice, and that this self-tolerance can be overcome using the VLP-Aβ conjugated vaccine. These results are consistent with other data using the VLP approach to produce antibodies against self-antigens . Comparison of anti-Aβ titers of Aβ vaccinated APP and nontransgenic mice after acid dissociation of Aβ and anti-Aβ antibody. Results are from sera obtained 14 days after the fourth vaccination. All samples were incubated at pH 2.5, centrifuged through 10,000 MW filters and neutralized before ELISA assay. So the effects of genotype could be directly compared in the three vaccine conditions, the nontransgenic titer value for each vaccine group was set to 100%. Data presented are mean ± sem. * P < 0.05 compared to APP mice given the same vaccine. Sample size is 5–6 per group. The data shown here indicate that at moderate antibody titers, circulating human Aβ in APP transgenic mice can interfere with the measurement of antibody titers in standard ELISA assays. At high anti-Aβ antibody titers, as found in the DM vaccinated mice, the antibody concentration appears to exceed the Aβ concentration sufficiently that the masking effects of Aβ have little impact on the apparent titer in ELISA assays. In support of this argument, we examined the effects of acid dissociation on sera from the APP mice obtained 10 days after the second inoculation with the DM vaccine, when titers were 1:800 without acid dissociation. In these sera, the dissociation treatment successfully increased the anti-Aβ titers to 1:6400. Thus, the failure of acid incubation to further increase titers for the DM peptide vaccinated mice shown in figure 1 (after the fourth inoculation) is likely due to an excess of antibody over circulating antigen, rather than some alteration in the antibody or its epitope associated with the DM vaccine. When we coated the ELISA plate with the DM Aβ instead of the WT Aβ, we find similar titers in sera from DM vaccinated mice, implying the antibodies raised with the DM vaccine are not specific to that antigen. When antibody titers are lower, such as after just two inoculations, acid dissociation does successfully unmask antibody using this vaccine. To address the issue of specificity of the Aβ values after the acid dissociation step, we performed two control experiments. In the first, we compared the ELISA signals from antisera with and without acid dissociation after coating the ELISA plate with alternative antigen targets in addition to Aβ1-42 (Figure 4). These included bovine serum albumin, alpha-synuclein protein and Aβ11-20. While the acid dissociation procedure slightly increased the nonspecific signal found even in the absence of peptide antigens (note the signal for PBS, phosphate buffered saline), the large increase in signal was limited to that for the full length Aβ peptide. The mid domain Aβ11-20 peptide failed to show any antibody binding beyond that found with PBS, consistent with the prior identification of most anti-Aβ antibodies being directed against the N-terminal domains [12, 13]. A second experiment evaluated the ability of Aβ to compete against the increased ELISA signal found after acid dissociation. Figure 5 demonstrates that Aβ1-42 at 10–100 μg/ml can effectively compete against the binding of the dissociated antiserum to the ELISA plate coated with Aβ1-42. 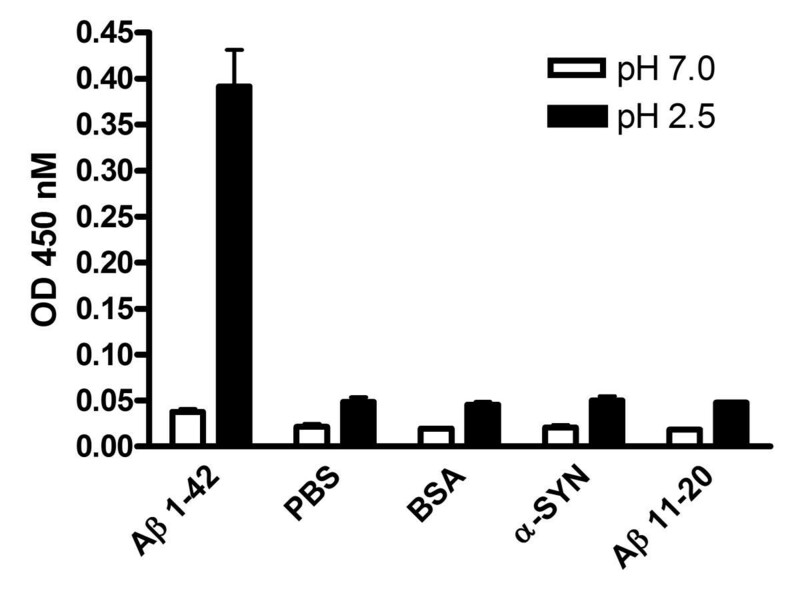 These data suggest that the increased binding to the ELISA plate after acid dissociation is selective for Aβ1-42 and can be blocked by Aβ1-42 added back to the antiserum. Specificity of increased antibody binding after acid-dissociation of sera from Aβ immunized APP transgenic mice. Sera were collected from transgenic mice, diluted 1:400 and preincubated at either pH 7 (open bars) or pH 2.5 (solid bars) as described in methods. The sera were then incubated on ELISA plates coated with Aβ1-42, phosphate buffered saline (PBS; a "no protein" control), bovine serum albumin (BSA), recombinant alpha-synuclein (α-SYN) or Aβ peptide amino acids 11–20. ELISA assays were completed as described in Methods and the optical density at 450 nm used to estimate the amount of antibody binding to the ELISA plate. Results are presented as mean ± sem. First, circulating Aβ can interfere with anti-Aβ antibody ELISA assays. The amount of circulating Aβ is known to vary considerably in AD patients . This observation of antibody bound Aβ does not appear to be limited to the Tg2576 mouse, as passive administration of anti-Aβ antibodies is known to increase the amounts of Aβ in the circulation of the PDAPP mouse  active immunization increases circulating Aβ APP+PS1 transgenic mice . It will be important in clinical studies evaluating the circulating anti-Aβ antibody content in humans to insure that the methods used for detection are not confounded by Aβ peptide that might be bound to these antibodies. Another possibility is the converse; that depending upon the methods used, circulating anti-Aβ antibodies may interfere with detection of circulating Aβ. Conceivably, this may account for the failure to observe increased Aβ after vaccination in humans . Second, the DM peptide vaccine is more effective than the WT Aβ peptide in inducing antibody responses. Immune responses against wild-type Aβ and the DM peptide are reduced to a similar extent in Tg mice relative to nontransgenic mice, suggesting that it is unlikely that reduced self tolerance owing to the potentially unique epitope in the Dutch peptide sequence is responsible for the increased immunogenicity of the DM peptide. Moreover, we found similar titers for sera from mice vaccinated with DM Aβ whether the ELISA was performed with the DM peptide coating the plate or the WT peptide coating the plate. However, it remains possible that T-cell help is limiting in the induction of IgG responses to WT Aβ, and the increased immunogenicity of the DM peptide is due to the presence of a stronger T-cell helper epitope for this strain of mice. Nevertheless it is interesting to note that the primary disease in patients carrying the Dutch APP mutation is an accumulation of vascular amyloid, with few parenchymal deposits . This is not unlike the pathology reported in the two autopsy cases of patients vaccinated with Aβ during a clinical trial [4, 16]. In an APP mouse model, anti-Aβ antibodies have been reported to increase the frequency of microhemorrhage . These results suggest the possibility that anti-Aβ antibodies might have some role in the unique pathology of patients carrying the Dutch mutation. Finally, self-tolerance to Aβ is apparent in the APP Tg mice, and the conjugated VLP-based vaccine appears to evade the mechanisms restricting formation of antibodies to self antigens. As Aβ is a self-protein in AD patients, the use of a VLP vaccine formulation may prove superior to more traditional immunization approaches. Future studies will address the possibility that higher VLP vaccine concentrations and/or different Aβ peptides may be even more effective in inducing anti-Aβ antibodies in a tolerizing immune background . The Tg2576 APP transgenic mice  and nontransgenic littermates (produced as described in  were vaccinated with human Aβ1-42 E22Q (Dutch mutant peptide; DM) from American peptide, wild type (WT) Aβ1-42 peptide (American peptide, Sunnyvale, CA) or papillomavirus virus-like particles conjugated to wild type human Aβ1-40 peptide (VLP-Aβ). Peptide vaccines were prepared as described previously . Briefly, For WT and DM, Aβ peptides were suspended in pyrogen-free Type I water at 2.2 mg/ml then mixed with 10 × PBS to yield 1 × PBS solution and incubated overnight at 37 degrees C. The following day, two volumes of 1 × PBS was added to dilute the Aβ peptides further, and then the peptide suspension was emulsified with an equal volume of Freund's complete adjuvant (Sigma). The vaccine preparation (100 μg Aβ/300 μl volume) was injected into each mouse subcutaneously. For the VLP material, Aβ-conjugated particles were generated by linking biotinylated Aβ peptide to biotinylated VLPs using streptavidin. 5.6 μg biotinylated (long-chain) Aβ1-40 peptide (AnaSpec Incorporated, San Jose, CA) was reacted overnight at 4 degrees with 22.5 μg streptavidin (Zymed, S. San Francisco, CA). This material was added to 7.5 μg biotinylated bovine papillomavirus (BPV) L1-VLPs by incubation at 4 degrees overnight to generate Aβ-conjugated VLPs. For immunization, 130 μl complete Freund's adjuvant was added to 170 μl VLP preparation containing 5.6 μg Aβ, then emulsified and injected as 300 μl into each mouse. For the second immunization, the same materials were prepared freshly in incomplete Freund's adjuvant (Sigma) at 14 days after first injection. The third and fourth boosts were made using incomplete Freund's at monthly intervals after the second immunization. Six transgenic and six nontransgenic mice for each group were vaccinated beginning at 9 months of age and sacrificed at 12 months of age, 14 days after the fourth inoculation. Sera were collected under anesthesia by retro-orbital puncture two weeks after the second and third inoculations and by ocular enucleation at sacrifice. Sera were diluted 1:100 with dissociation buffer (PBS buffer with 1.5% BSA and 0.2 M glycine-acetate pH 2.5), to a 500 ul final volume and incubated for 20 min. at room temperature (RT). The sera were then pipetted into the sample reservoir of Microcon centrifugal filter device, YM-10 (10,000 MW cut-off; Millipore) and centrifuged at 8,000 × g for 20 min. at RT. The sample reservoir was then separated from the flow through, placed inverted into a second tube and centrifuged at 1000 × g for 3 min. The collected solution containing the antibody dissociated from the Aβ peptide was adjusted to pH 7.0 with 15 μl of 1 M Tris buffer, pH 9.0. The retentate volume was bought to the initial volume (500 μl) with ELISA dilution buffer (PBS with 1.5% BSA and 0.1% Tween-20, pH 7.0). The collected sera were then added to an ELISA plate at multiple dilutions to determine the limiting antibody titer. For non-dissociated sera values, the same serum was treated with an identical process except using dissociation buffer at pH 7.0 instead of dissociation buffer at pH 2.5. The above dissociated sera were assayed by ELISA for antibody titer. Ninety-six-well Immulon 4HBX plates (Dynex) were coated with 50 μl per well of WT Aβ1-42 peptide at 5 μg/ml in PBS buffer, pH 7.0 and incubated overnight at 4 degrees C. The plates were washed five times with 0.45% BSA + 0.05% Tween-20 (washing buffer, WB) and blocked at 37°C for 1 hour with blocking buffer (1.5% BSA and 0.05% Tween-20 in PBS). After five washes, the sera were added in duplicate at an initial dilution of 1:100 and diluted two fold serially in blocking buffer and incubated for 1 hour at 37°C. The plates were washed 10 times and anti-mouse IgG conjugated with horseradish peroxidase (HRP) (Sigma Chemical Co. St. Louis, MO) diluted 1:5000 was added to the plates and incubated for 1 hour at 37°C. The plates were then washed ten times and developed with 3', 3', 5', 5'-Tetramethylbenzidine (TMB; Sigma). The reaction was stopped with 2 M sulfuric acid. The plates were analyzed spectrophotometrically at 450 nm. Qingyou Li, Chuanhai Cao contributed equally to this work. This work was supported by NIH grants AG 18478 to DGM and AG20227 to KEU. We thank Karen Hsiao-Ashe for previously providing us with Tg 2576 mice and Karen Duff for the PS1 mice. QL prepared the vaccines and injected the mice, performed the ELISA assays and collected and analyzed the results. CC prepared the vaccines, injected the mice and developed the acid-dissociation procedure. BC and JS developed the VLP vaccine preparation and assisted in editing the manuscript. KU directed the ELISA procedures and assisted in data analysis, MG generated the mice for the study, prepared the vaccines, collected the samples used for the ELISA procedures, and assisted in editing the manuscript. DM conceived the design of the study, guided data interpretation and authored the first draft of the manuscript. Competition with Aβ1-42 against the increased antibody binding found after acid dissociation of sera from APP mice vaccinated with Aβ. Sera were collected from transgenic mice, diluted 1:1000 and preincubated at either pH 7 (open bars) or pH 2.5 (solid bars) as described in methods. After centrifugation and reconstitution of serum volume, the sera were incubated with Aβ1-42 at the indicated concentrations. Because the Aβ was initially dissolved in DMSO, some samples were also incubated with DMSO at the concentrations found in the 100 μg/ml Aβ incubation (2% DMSO). ELISA assays were completed as described in Methods and the optical density at 450 nm used to estimate the amount of antibody binding to the ELISA plate. Results are presented as mean ± sem.